This article explores the question of how collective decision-making in the Rolandslied by Pfaffe Konrad is influenced by narrating violence. 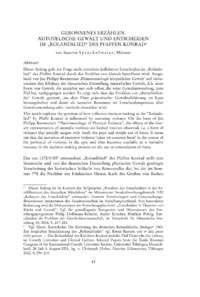 On the basis of Jan Philipp Reemtsmas Phenomenology of Physical Violence, the effects of the literary representation of autotelic violence are looked into/are observed, i.e. a form of violence that initially targets only itself, the pure and simple use of force. It turns out that the narration of excessive violence takes on concrete form in the course of the portrayal of violence in the epic and thus becomes available as a narrative resource in the decision-making process on the use or renunciation of force.